Three years ago to this day, I was unceremoniously fired from my job. At the time, I felt like a big failure. After all, no one got fired from the company I worked at. It was such a big deal that I pretty lost touch with all my peers there, because I guess, I was outside the “circle of trust” now. My job was a pretty good gig – fairly interesting work, a nice view of downtown Toronto, good people, competitive pay… everything that added up to mediocre satisfaction. Getting fired was awkward and embarrassing for me, and it still takes me a bit of courage to write this post as well as the letter later on below. The truth is, my (many) superiors were right in seeing my decline and giving me a way out. I couldn’t do it anymore. I was a pretty good software engineer/Dilbert with several years of experience. However, I was getting tired. I traded my raises for more vacation time, and it still wasn’t enough. I hated travelling in short spurts and whirlwind vacations. I hated scheduling family time around a limiting work schedule. Physically, I was worn down. My eyes got tired while my head hurt as I stared at a computer screen for hours on end. I felt stiff from sitting in one spot for such long periods of time. I did my best to counteract the negative physical effects by biking an hour to work in good weather, hiking eight flights of stairs up to my office, and doing yoga during lunch; but they were all really weak attempts to patch a greater problem. Mentally, I was at my wit’s end. There was nothing I was working on that stimulated me. Day in and day out, I had nothing to look forward to but the same massive chunk of programming code. I was trading my time away for perceived security and comfort. During employee reviews, I requested transfers to other departments to explore other lines of work as well as to go part-time, which only raised the alarms. Other positions might have been a change but most likely would have been even more mind-numbing. In all honesty, I was looking elsewhere already, and had begun tinkering away on side businesses, but it was difficult to do both at the same time since the 9-5 was draining all my time. I was taking too long to get it together to leave – I didn’t know what life was like anymore outside the 9-5. I am writing this letter with sincere gratitude and appreciation for your part in terminating my employment with Initech three years ago. It wasn’t obvious then, but now I see it as one of the greatest opportunities that has ever happened to me. At the time, it was clear that I was in a physical and mental decline from the work I was doing, and that I was seeking a different line of creative work which Initech didn’t offer. Coupled with headaches from staring at a monitor for so long, my work output wasn’t what it used to be. After being terminated, with no desire to return to a similar position, I chose to start a number of small businesses. It was an uncertain beginning, but a refreshing one. My creative energy returned, and I felt highly motivated as I put my energy into my own projects. Surprisingly, as I started doing what I loved to do, the businesses did well, and I was able to free my time. Now, I have much more time to spend with my family, to learn new skills, to travel, and to contribute back. I believe I would have been on this path regardless, but it would have taken much longer without your intervention. I sincerely apologize that I put you in such a difficult position, and I am confessedly ashamed for my lack of courage to leave Initech first. That was the last time I let my fears own me. Again, I really want to thank you for your part in making the decision to let me go, or, as I see it these days, to set me free. Perhaps you’re reading this wishing for the same. I can’t tell you to cut loose – I understand how difficult it is. I was building the courage and capital to leave, but honestly, I would have painfully sucked it up for another year or two (i.e. an eternity) while doing my own thing on the side. Don’t sit there counting the pros and the cons of your life situation – you’re just going to get stuck in the paralysis of analysis. I can tell you that if your daily work routine is eating you up inside, you need to listen to your heart, take action, and start moving in the direction of where you want to be. That alone will make your heart beat again. For me, even thinking of all the years I spent in my previous jobs – the confining cubicles, the mind-numbingly grey atmosphere, the draining repetition, the late hours, the bad coffee, etc. – it makes me cringe. Please use my story as a life lesson. Please don’t be conquered by your mental fears (fear of failure, fear of what other people think, fear of being broke). Please don’t put your fate in the hands of others. Please don’t wait for others to take action. Please don’t get to the end of your life regretting all the risks you didn’t take. We don’t have a lot of time here, so if you really want change, if you really want something, you have to do something about it NOW. Inspiring post Ki’une! Coincidentally, I was watching your Sunscreen Video last night (watch it from time to time when I need to refocus and remember why I seek the path of freedom). It inspired to write about changes and not waiting for changes to be forced upon you to act. Thanks for sharing your story. I appreciate it, retweeted. I somehow wonder if you could actually give a more practical/”grounded” info about how you managed to live that free life: What are these side businesses & can anyone really do those, how do you manage your family whilst traveling so much, how can you afford to travel so much whilst having left your job along your competetive salary, what if the sunscreen is empty….? You’ve illustrated the “why’s” perfectly, I’m just missing the “how’s” a bit. Obviously this site is mostly about inspiration, but as you’re actually the one who managed to live this, me and probably others would appreciate some more stories about how exactly you actually live that life. to zezeri if you are truly seeking more freedom from the work place i recomend reading the 4 hour work week by tim ferris its practical, and even if you dont want to quit your job he offers other solutions i hope this helps you as much as its helping me. Love it! Out of curiosity, did you actually send the letter? Any response? I’ve been thinking the same thing every day. When I’m not at work, I’m excited and passionate. When I’m at work, I get bored. Only I’ve only been back for a month, after spending 4 months travelling in Nepal. I’ve got side projects and I’d love to pull the plug, but I can’t yet. I’m shooting for the end of the year to be back on the “dusty trail”, so I’ve got a deadline and I’m planning on hitting it. Oh yeah, I sent the actual letter (3 copies to each former superior) 3 months ago. I didn’t leave my contact information for a response. I preferred it to be a one-way communication. Thanks for the feedback! Thank you for having the courage to write this letter and to publish it, for all to see. It can feel humiliating to be fired, or I think even worse, to not have the courage to leave, but do just enough to stay under the radar – thus not allowing ANY decision to be made, by you or your employer. I had a path, not completely dissimilar to yours – I had been at the same company for 8 years. I loved the people I worked with, the clients I worked with and loved certain things that were required of me in my job. the problem was that I was not using my creativity, I was using a lot of brawn, and not a lot of brain. I was furthering the dream of the company I worked for, but not furthering my own. I too tried to start businesses, or projects on the side (my work week was a minimum of 60 hours each week), plus have time for myself and my family. As you can imagine, I didn’t get very far on any of my ideas, or projects as I was too tired to put my energy in them to develop them. After 18 months of trying that, I decided I had to bite the bullet, my creative soul was going to shrivel up and die if I didn’t nourish and feed it. I took a big leap (as I have a lot of financial commitments) and I mapped out financially what I could afford to do. I was going to take a year off and figure out my life. No agenda, no concrete goals. Just have an open mind and an open heart. That was on August 31st of 2010. It was the best decision I have ever made in my life. I am happy, my relationship is better, I have met amazing mentors and new friends. I have figured out how to take the best of what I know how to do and the things I love to do and have turned them into a business. I am about to launch this business in several weeks. Your video “Dance Like No One Is Watching” (i think that was the name), so inspired me, and I am thrilled to know that you are doing what you want to do and sharing it with the world. My new web-based business is called http://www.discerningminds.com. I will teach my lessons and help people do what I did: Drop Out, Tune Into Myself and Turn On My Creative Lightbulb. Keep on shining your light!! If you love what you do for a living, you will never work another day of your life…. That is very inspiring! When you have structered work etc I find it easy to concentrate and work etc but when working for myself I find it so easy to procrastinate on the internet, watch T.V or generally do something unproductive! I was wondering how do you get over this hurdle? I know it is just a problem to be overcome but just looking for tips from someone who (probably) has overcome procrastination! Thanks for your blog and even more if you help me! I randomly found your “Wear Sunscreen” video a few days ago and felt the need to share it on my blog. I hope that’s alright with you, because you know, sharing is caring! Finding that video has subsequently led me to your websites. I haven’t been able to more than browse through a few of your posts, but I must say that your experiences seem to mirror mine, for the most part. I am excited to read more about your adventures and your thoughts! Thanks so much for sharing! I checked out your blog, and yeah, you’re on a journey that most dream of all their lives! Hola, my name is Raquelle and I’m a fan of this site. I found your Wear Sunscreen video on youtube by accident. I now watch it in the mornings before I get started with my day, as I find it to be very inspirational and positive. I work with special needs children in a very low SES region of South Texas. Although I make what is considered to be pretty good money as a speech pathologist doing what is considered noble and respectable work and live fairly comfortably ( a block away from the beach on a small island called South Padre), there are days I find it hard to motivate myself to go into work. I can’t help but feel like a hamster in a wheel. I often feel guilty because I went to school for about seven years to do this, and sometimes I feel like I need a change. The helping profession can be psychologically, physically, and emotionally draining…..and this makes me feel guilty. Anyway, your video helps jump start my day in a very positive way. You’ve also inspired me to travel alone. I’ve traveled a bit to Asia and Europe, but never alone. I decided that I want to try the Inca Trail to Machu Picchu. The thought of me being alone in Peru scares me, but in an odd, wonderful way. Keep doing what you’re doing. I’m sure you’ve inspired many by now. As for Machu Picchu, the path is pretty well beaten. If you want to save a lot of money, just show up in Cusco and book your trek there. I paid $140 for the Salkantay Trail. The only downfall with just showing up is there is a low chance of getting the Inca Trail. Another secret is Mancora, a surf town in northern Peru. Great surfing! 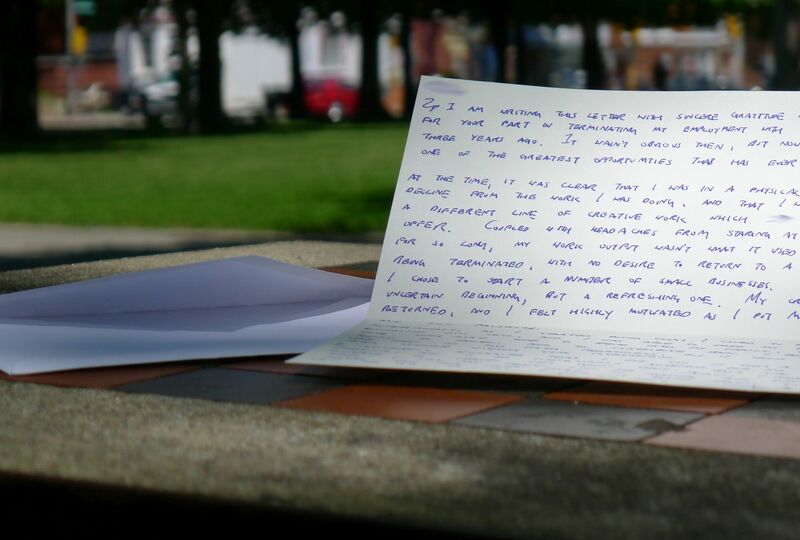 That letter you wrote shows true maturity. You’re a real class act. Thank you Ki’une. I know what I must do now and I will be brave about it. It’s been a while since you wrote this post but I just wanted to write and say thank you for sharing your story with others. I, too, was in a similar situation to what you described above in your post, and while mine happened more recently, your example and courage to do what you did still ring true to my ears. By reading this post, you inspired me to do likewise and send a letter to my previous employer that conveyed a similar message as yours. Thank you for continuing to push your boundaries and share part of your experience with others. As strange as it may seem to say this, knowing that there are others out there who felt the same way about a phase in their life gives me the confidence to stay true to my convictions. It helps immensely to feel that you are not alone in this journey called life. Thank you again and I wish you continued success and prosperity in your chosen path! I’ve just found your post so randomly as I was looking for words to express my feelings. I just got fired yesterday and I still feel sad, upset, frustrated, betrayed, lost, angry, fearful and all above. And somewhat relieved. My mind is racing in fear…but I am very happy to read your story and all the other comments as I need clarity and inspiration. I need time to figure this one out. Awesome. Glad to have helped, Nora!